My astrophysics problem for the week was the topic of surface brightness. What is it and how is it measured? Recall that while a star's brightness is just reported as its apparent magnitude, the extended objects like galaxies and nebulae have their brightness reported in magnitude units of "surface brightness". A relatively bright extended object, like the Orion Nebula, has reported surface brightness of 3 magnitude and is quite large and has an apparent size of about 60 arc minutes So if you collect all of the light from this object it would be reported the same as if all of the light came from a magnitude 3 star. A star is considered to be a point source, so all of its light should just be found at a point in the camera image, but a more realistic definition is to report the magnitude as if it were all contained within just one square arcsec. So, since the nebula is so large, you can see that it will appear very dim compared to a magnitude 3 star even though both of these objects represent the same amount of total light received at the scope. My primary target of interest in evaluating surface brightness measurements is the Milky Way which has a typically reported surface brightness of 20. This means if you collected all the light from the Milky Way, as seen in your camera, it would have the same apparent brightness as a star of magnitude 20. To see the Milky Way, the background sky and skyglow must be dimmer than magnitude 20. Now we have some uncertainty in how the size of the object like the Milky Way is to be reported, but we can still compare some measurements. 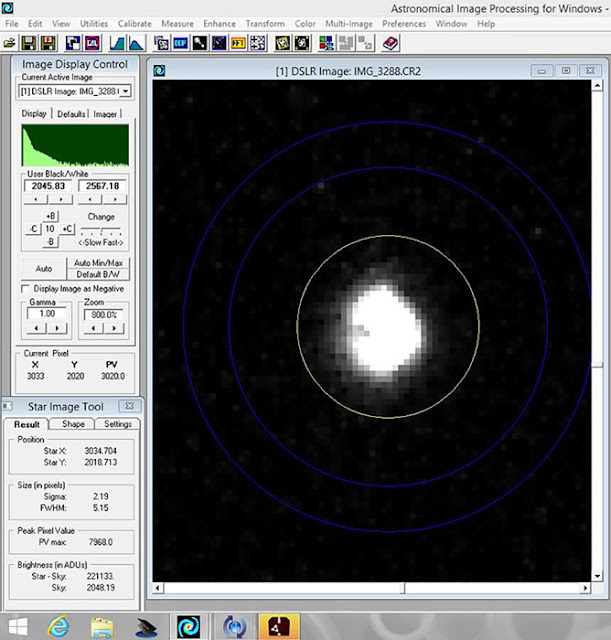 So, to get started, lets use a conveniently available star, Vega, with reported apparent magnitude of 0. The AIPWIN screen shot below shows how Vega appears in my 300mm telephoto lens. It is a bit strange to look at stars with real lens and such and see how their appearance differs from our assumed sphericity! The total light collected by my camera in this case is seen to be 221,133 camera units. You can see in this image that the star image spills over into many pixels and all of the light within the yellow annulus is collected and summed and then the average sky background light, as summed in the outer blue annulus, is subtracted, so that just the light from the star is reported. This measured value includes all sorts of other effects which are a function of the gain of my camera sensor and the elevation angle, which sets how much atmosphere attenuation of the star light happens, so we shouldn't rely on this one measurement as an absolute measurement. But we can use this relative value of how much light is received from a known magnitude star and compare this amount with the light we receive from a dim extended object. Ok, now that we some reference camera data for a magnitude 0 star, lets examine an image of the Milky Way and see what we can estimate for its surface brightness. Various estimates found online indicate the published surface brightness is about magnitude 20. This means that if all the light from the Milky Way were collected it would be as bright as a magnitude 20 star. The technical definition of surface brightness then says that the average brightness of each square arcsec of the extended object will be as bright as the 20 magnitude star. How does a magnitude 20 star compare with the brightness of our magnitude 0 comparison star? Well, each difference in magnitude of 5 corresponds to a factor of 100 in light, so a magnitude 20 star is 100 x 100 x 100 x 100 = 100 million times dimmer than, in this case, Vega. 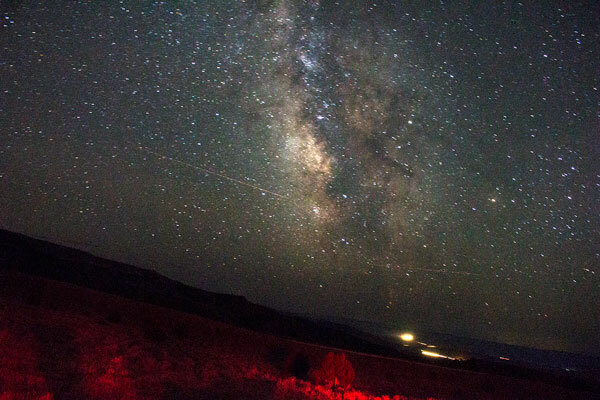 For our test subject of the Milky Way, let's use the image shown below which was taken in Casper, WY, just prior to our observation of the total solar eclipse. This image was taken with DSLR wit attached 18mm focal length lens and F/5.6 and ISO = 3200 and shutter set to 61 second exposure. If you are interested in other details you can go back to the main blog page and look up the August 17 and 21 blog posts. Now, let's import that image into AIP4WIN and examine how bright the image of the Milky Way is with those particular lens settings. In the screenshot below, I just picked an arbitrary profile line across a typical bright portion of the Milky Way. 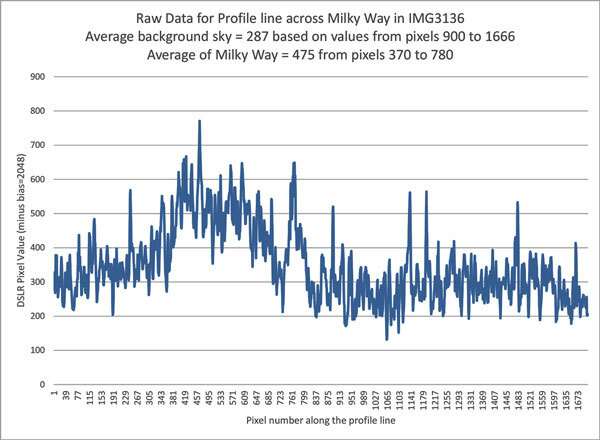 It is hard to know what portion of the Milky Way should be used to do this kind of analysis, but this arbitrarily chosen profile line is what I chose to use. The 2nd part of the screenshot shows the light intensity along that chosen profile line. Umm, not much difference in intensity between the lit up areas of the Milky Way and the dark sky background! There is a noticeable little bump in intensity but it sure does not really jump out at you. Is this little bump in intensity what we would expect from an extended object with surface brightness of magnitude 20? Let's apply the known correction factors to this image so that the previous measurement of Vega can be compared and see what pixel values of intensity we expect. Four factors are immediately required. First we have to adjust the measurements to account for the different lens apertures used. 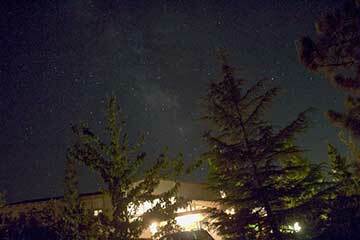 The Vega measurement used aperture of 300 / 5.6 = 53.5 mm and the Milky Way measurement used aperture of 18 / 5.6 = 3.21 mm. So, since the light collection depends on the square of the aperture, the lens used on the Milky Way collects only (3.21 / 54.5)^2 = 0.0036 times the amount of light. Next we need to adjust the measurement to account for the shutter time difference which was 61 seconds for the Milky Way and only 1/60 second for Vega. So, the longer exposure time means the shutter for the Milky Way image was open 60 x 60 = 3600 times as long. Next we need to adjust for the different focal length. The field of view for the 18 mm lens used for the Milky Way is 45 x 67 degrees. So each pixel in that image covers 46.875 arc seconds on each side for a total of 2197 square arcsec per pixel. Lastly the ISO speed for the Milky Way image was set to 3200, while the Vega image was shot with ISO = 800. The Milky Way image pixel intensity will be 4 times larger due to this factor. So if we apply all of these adjustment factors to the Vega measured light intensity of 221,113 units, we find we should get 0.0036 x 3600 x 2197 x 4 x 221,133 / 100,000,000 = 252 units per pixel. This is the predicted value if the Milky Way has a surface brightness of magnitude 20. How well does this match what we actually measure? Well, let's import the AIP4WIN data into Excel and do some more analysis. First the raw profile intensity data was smoothed using a 4 pixel moving average. Nothing special about this selection, just arbitrarily chosen. Next the dark sky background was estimated to be about 287, again just based on using that portion of the profile line that seemed to correspond to just normal sky background. The little bump near where the Milky Way was really bright and visible is again estimated to have light intensity of 475 units per pixel. So the Milky Way is about 475 - 287 = 188 camera units per pixel brighter than the background. Hooray, the predicted value was 252 and the measured value was about 188, which is pretty close given all the uncertainties in the measurement! Remember too that if the reported magnitude differs by say just one magnitude, that difference represents a factor of 2.5 times, so surface brightness magnitude 20 seems to be a pretty good value to use. Also, it seems clear that just relying on a linear profile through the image of an extended object is not sufficient and additional analysis should be done by considering the entire visible area of the object. Ok, after all of the calculating, I was ready for some more actual observing. 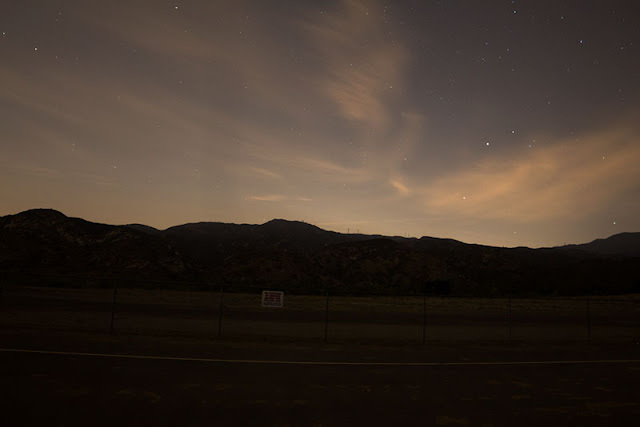 As far as new night observing was concerned, the clouds and forecast did not seem to be that great, but we took a chance and headed up to the OCA star party, now conducted a couple of miles up the road from Blackstar Canyon, to the Bob Swenson Field, which is used by radio controlled model airplane enthusiasts during the daytime. This was our first time at the new location and the site has much better parking than the old one. You can drive and park right next to where you are going to set up so that was a very nice new feature. Nice! My own prediction was that the could cover would be too heavy so I elected to just bring my DSLR and tripod with the wide angle F2.8/14mm lens rather than the scope too. I wanted to get some long exposures of the sky in the new location and didn't want to spend a lot of time setting up the scope and aligning and all that. There were plenty of clouds but stars could still be seen. Resident Astronomer Peggy was able to use her binoculars and recliner to enjoy the night sky, until it got a little too cold for her. The 10-second exposure photo below shows one view of a whole string of scopes making their first observations. The sky was too bright and cloudy for me to have much of a chance of imaging a wide angle view of the Milky Way, but it was still a fun night out, even if we did pack up and leave before 8 PM. 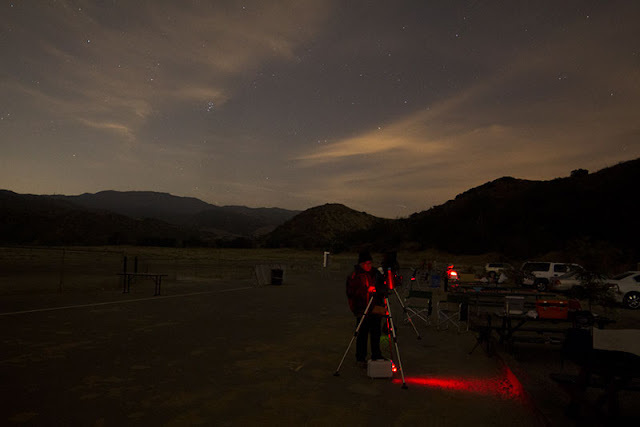 Many of the other amateurs reported good views of the Messier objects that were up. It was also neat to see several groups of amateurs setting up for the first time with scopes that they had just picked up from the OCA loaner program. New Astronomer, Valerie, was there with her associates and set up the scope for their first time. Resident Astronomer Peggy met them and asked me if I could check in on their progress. It turns out the battery pack was not plugged in and in addition there were no AA batteries installed either. But with a little luck and sharing from other astronomers, 8 AA batteries were found and the scope came alive. Good luck, Valerie! Each of us, even though we have been out observing many times have similar learning experiences with our own equipment, but it is all part of the fun. There was a lot of excitement there and other places along the line of telescopes and we were glad to share in that and help out the little bit that we did. We really like the ample parking at the new site and appreciate all that OCA Star party coordinator, Steve, has done to get authorization to use this site. Thanks, Steve!